Jackie and Tanya are graduates of Bowman Technical School of Lancaster, Pennsylvania which was one of the oldest jewelry and watchmaking schools in the U.S. prior to closing. They have many years of experience working at the bench. Both are former goldsmiths of the H.C. Garthe Company in the Village of Cross Keys which was a Baltimore, Maryland guild store from the 1800s. 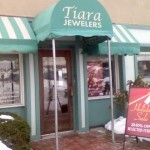 Tiara Jewelers is centrally located at 104 E. Pennsylvania Avenue in Towson, MD. Our phone number is 410-296-8119. Please contact us with questions about pieces and services.